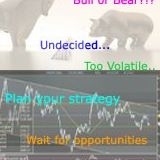 Home » Equity Strategy , Technical Analysis » Asia Pacific Strategy - Alpha Edge: July bottom is here? ■ US S&P500’s triangle formation consolidation could have ended two weeks ago. ■ MSCI Asia ex-Japan could have completed the “A-B-C’ correction two weeks back. ■ The Bloomberg Dollar Index could correct for another few weeks. ■ KOSPI’s “A-B-C” correction could have also ended two weeks back. We were earlier looking for a bottom in global equity markets this July. From the Jan high this year, the US S&P500 looked to be trading in a triangle pattern and if we are right, this triangle formation was completed two weeks ago. A new uptrend could have already started for the S&P500, targeting at least the last high of 2,872pts. Weekly MACD has overcome its resistance trendline, which is usually medium-term positive. However, a break below 2,691pts would negate the triangle formation. MSCI Asia-ex Japan Index (MXASJ) could have bottomed out two weeks ago at 652pts (which was marginally higher than our 645-650pts support) after completing the “A-B-C” correction. If we are right, the MXASJ should exceed the last 780pts point high over the next few months. The Bloomberg Dollar Index’s correction is still ongoing and might need another few weeks to complete the correction before starting the next uptrend. Key support is at the 40-week SMA of 1,154pts. We are not sure whether the correction for the US 10-year government bond yield is already completed before the next upleg begins. However, the weekly chart shows an immediate term support at the 2.86% levels but daily indicators show no signs of yields bottoming yet. Hong Kong’s Hang Seng Index’s weekly chart shows that the Index’s “A-B-C” correction might not be over yet. If wave “C” equals the length of wave “A”, the Hang Seng Index could fall to the 27,160pts level before bottoming out. Key resistance is at 28,420pts. South Korea’s KOSPI’s weekly chart shows the “A-B-C” correction for the Index could have ended two weeks ago when the Index reached a low of 2,243pts. 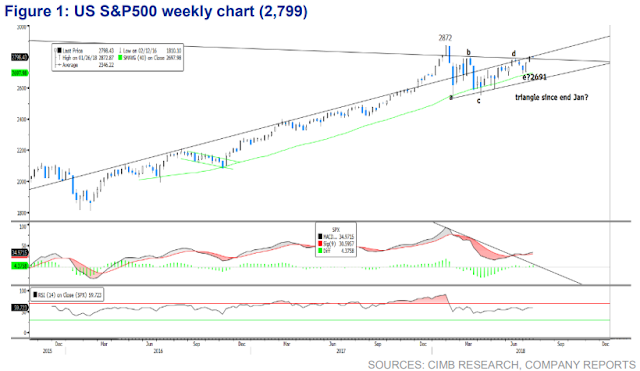 However, the weekly MACD and RSI indicators have not overcome their respective resistance trendline, an indication the index could consolidate first over the next few weeks. Malaysia’s KLCI’s and Indonesia’s JCI’s first major downleg ended two weeks back and a rebound is already in progress. A 38.2-50% retracement of the downleg for KLCI pegs the index between 1,748pts and 1,776pts. A 38.2-61.8% retracement of JCI’s downleg pegs the Index between 5,991pts and 6,270pts.